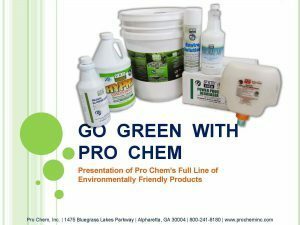 GREEN CLEAN | Pro Chem, Inc.
GREEN CLEAN is a Safer Choice certified performance cleaner that deodorizes while it removes soils and greases from all surfaces. It is the cleaner of the future because it has no harmful toxic vapors, making it more appealing than water-soluble solvent cleaners. 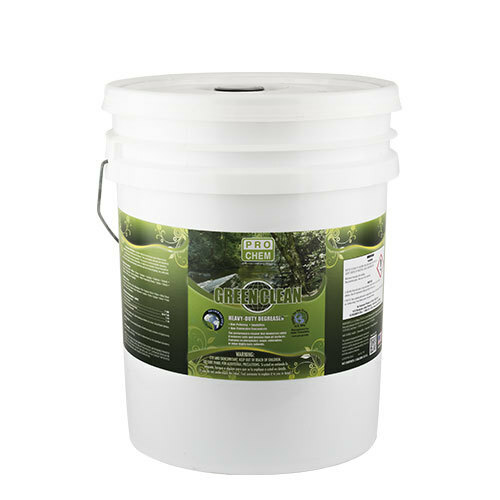 This product is environmentally appealing because it contains no soaps, phosphates, cellosolves or highly toxic solvents. It is recommended for use where water-soluble solvent cleaners cannot be used and anywhere greasy, oily soils exist. This concentrate is authorized for use in federally inspected meat and poultry plants, but a potable water rinse is required after use. A POTABLE WATER RINSE IS REQUIRED WHEN USED IN FEDERALLY INSPECTED MEAT AND POULTRY PLANTS. For exceptionally stubborn soils, repeat cleaning procedure at a more concentrated dilution. Rinse thoroughly after use. Do not use undiluted on composition floors, water-based painted surfaces or aluminum. Strong concentrations may leave a film on glass. For this reason, use a dilution rate of less than 5 oz. 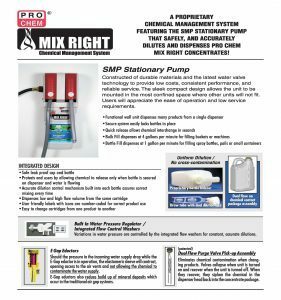 product per gallon of water.